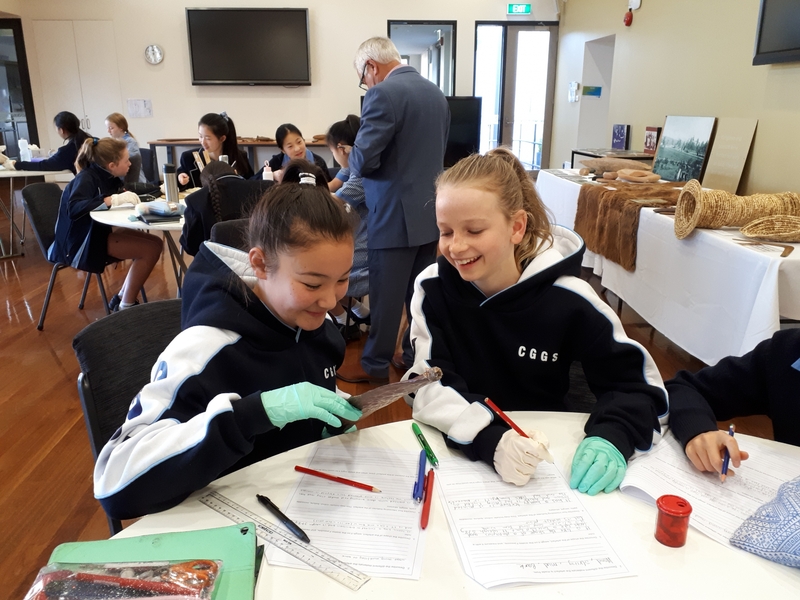 The past fortnight in Senior School has been filled with wonderful opportunities for our students. They will all be looking forward to their Easter break and some time to relax. 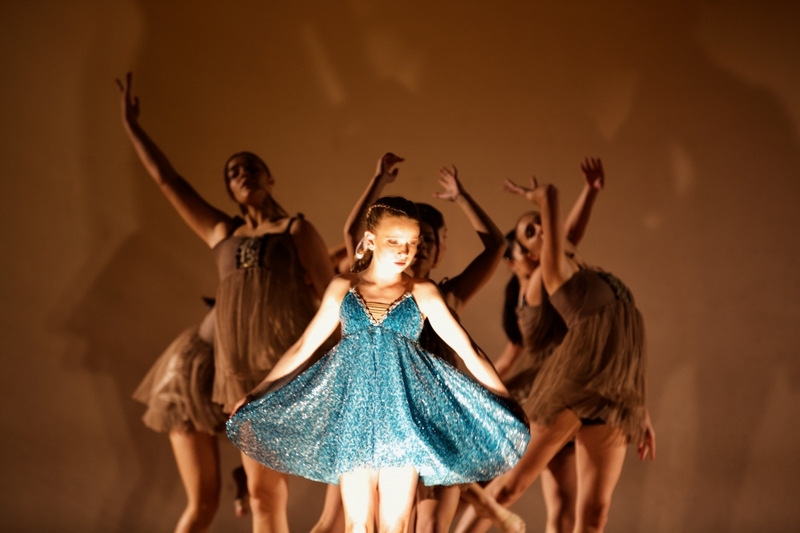 The House Dance performances on Friday 22 March made for a truly spectacular night. Some of these girls spent the next day and night at the Hawthorn Relay for Life. 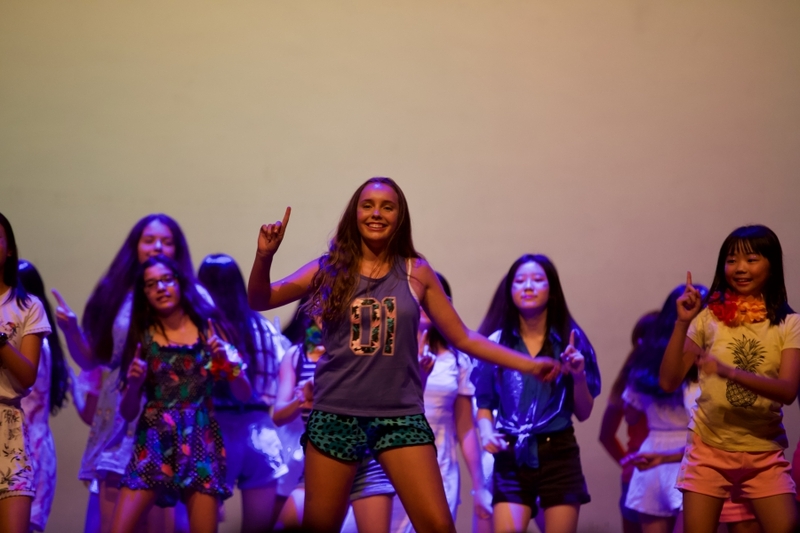 House Music Auditions took place in the week of 25 – 29 March and a number of Senior School students then headed off to Phillip Island for Fitness Camp, while parents and staff enjoyed the Autumn Fiesta. Thank you to the Parents and Friends Association for organising this night where our community mingled with friends old and new and enjoyed catering and drinks provided by Pinwheel & Co. 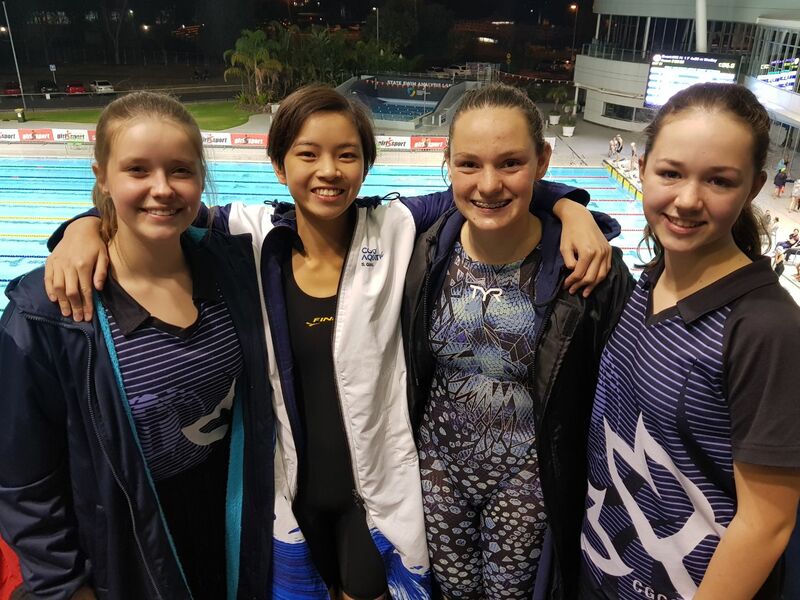 This week we have enjoyed success in the pool with our students representing CGGS at the GSV Swimming and Diving Finals Evening. Both our Intermediate A and Junior A Softball teams have played off in GSV Grand Finals at Jells Park. Rev Creed led a number of students from the Mustard Group in our very special Easter Service at St Mark’s, and we said farewell to our students and staff attending the inaugural Literature Tour of the UK. 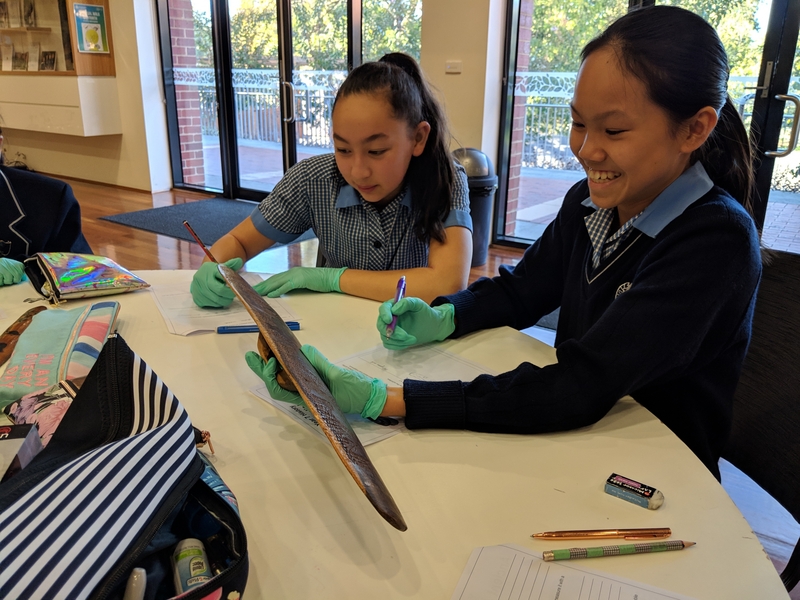 Term 1 has flown by and our new Year 7 students now feel very much a part of the CGGS school community. Thank you to all the students, staff and parents for their involvement in the various aspects of school life throughout this term. I wish all our families a Happy Easter and a safe holiday break. A stellar night of dance was had by all on the Friday 22 March. With over 200 students participating in this year’s event, the crowd was at capacity in Barbara Sutton Hall. 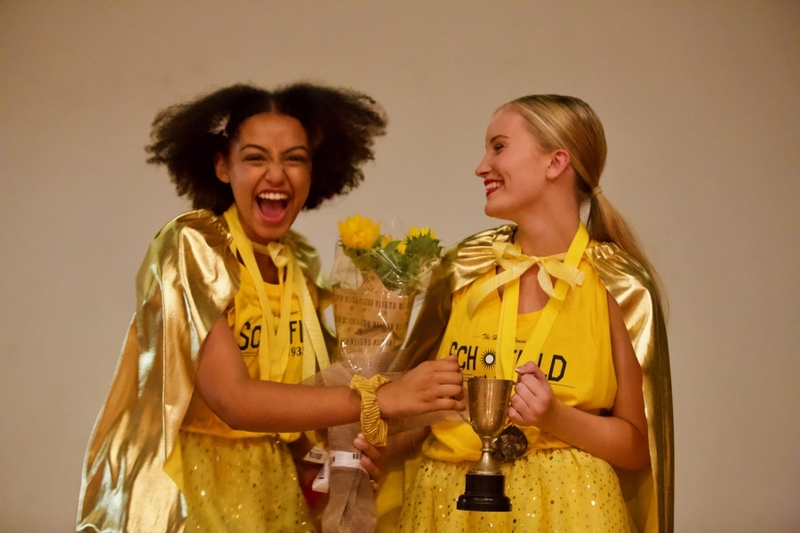 Overall winning House for 2019 – Schofield! 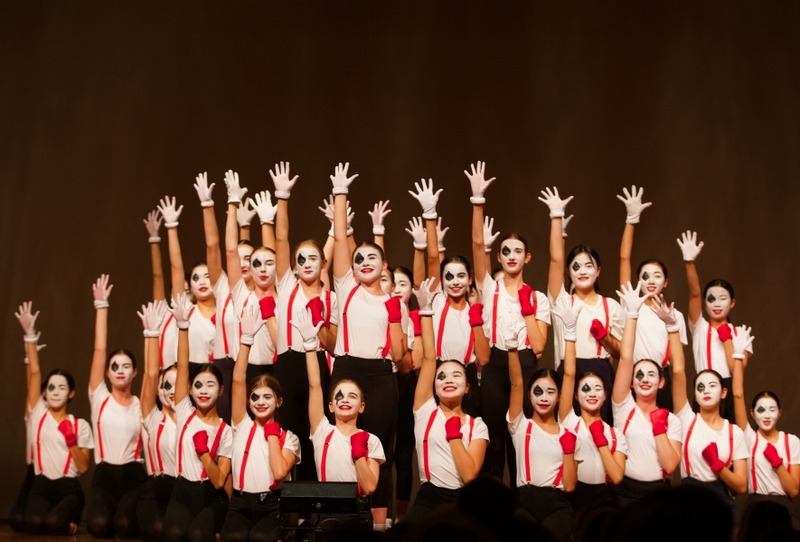 Congratulations to all participants – what a magnificent way to kick off our Performing Arts events for the year. Good luck to all of our House Music Captains for their upcoming event next term. 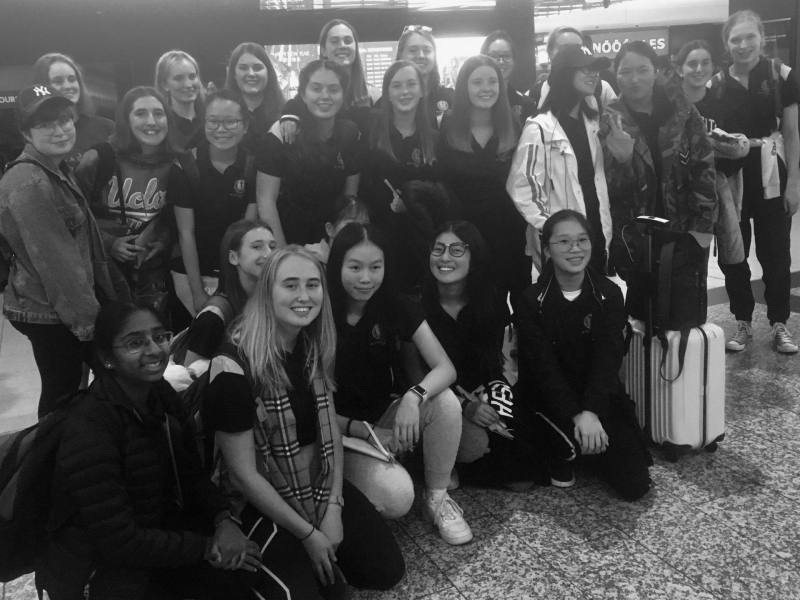 24 students departed Tullamarine Airport yesterday morning, travelling with Head of Library, Mrs Anne Devenish, PE/Health and Science teacher, Ms Liza Stevens and Library Assistant, Ms Ren Pennessi – on the inaugural UK Literature Tour. The group’s itinerary includes visiting many famous landmarks in London, Chawton, Winchester, Salisbury, Stonehenge, Bath, Cotswolds, Oxford, Stratford upon Avon, Hawworth and Windermere. The group will return to Melbourne on the Thursday 18 April. We wish them safe travels and very much look forward to hearing of their adventures next term. 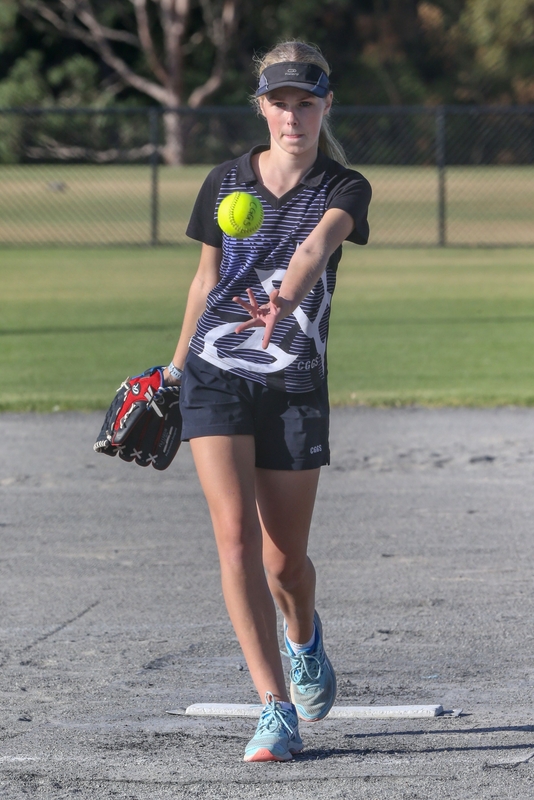 On Thursday 28 March, both the Junior Softball A-Grade and B-Grade teams competed in the GSV Junior Softball Finals at Waverley Softball Grounds in Jells Park. Both teams had trained hard and showed great spirit throughout the season to go through the home-and-away season undefeated. 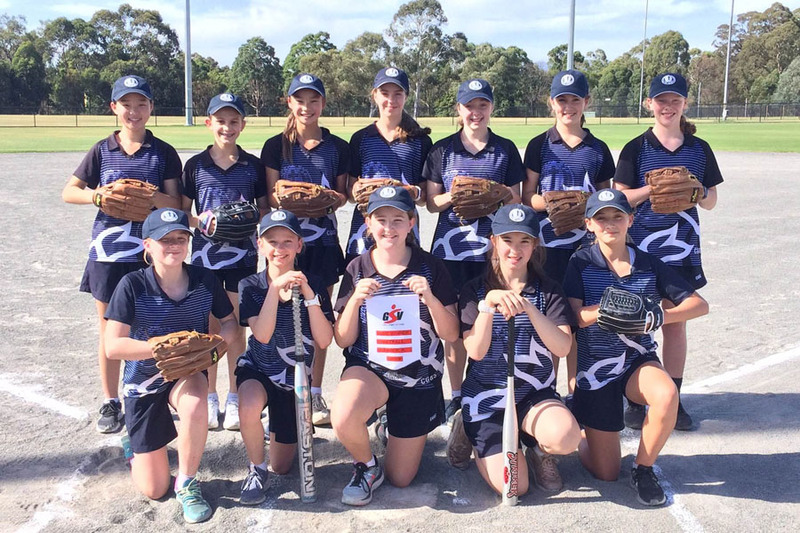 As a result, they finished top of their zones and were presented with the Zone 4 Winners Pennants and qualified for their respective Finals competitions. The A-Grade team (above) played against Sacre Coeur. It was a tightly fought contest with both teams playing at a very high level and after 4 intense innings, CGGS came out on top to win the game 11-10. The B-Grade team (above) played against MLC. The girls played the match with high levels of energy and gave everything they had, but MLC proved to be too strong, eventually winning the game 17-5. 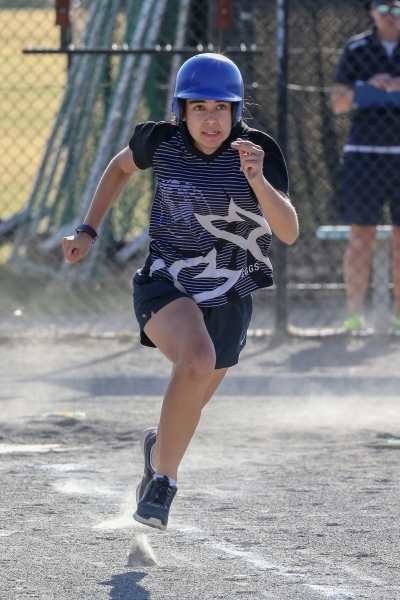 It has been an exciting week for the GSV Intermediate A and Junior A Softball teams, with their Grand Finals being played at Waverley Softball Centre, Jells Park. With both teams having solid Semi Final victories last week over Ruyton and Sacre Coeur respectively, players and coaches were primed and ready for the task ahead. On Wednesday night, in a highly skilled and tight contest, the Intermediate team were unfortunately defeated by Korowa and were crowned runners up for 2019. In an impressive display of their skills late in the game, the crowd appreciated some big hitting, incredible base stealing and excellent fielding. Backing up on Thursday night, it was the Junior’s turn to see if they could bring home the coveted title. Having fought and won their semi-final by one run the team was feeling nervous but eager to get the job done against their rivals OLMC. After being sent in to field, our girls put their excellent skills to use immediately and achieved 3 outs without a run being scored. A solid hitting display by CGGS followed in the first innings and set the scene for the rest of the game. Some brilliant catches, 2 double plays and some awesome base stealing ensured the final result went our way, eventually being crowned Premiers with a 12-7 win. It has been an absolute privilege to train and coach this group of dedicated and highly skilled students. Their passion and knowledge of and for the game is displayed each time they take the field and we are incredibly proud of their efforts throughout a long season and are already looking forward to doing it all again with them in 2020. Congratulations girls! A phenomenal result – GSV A Grade Junior Premiers and GSV A Grade Intermediate Softball Runners Up for 2019. 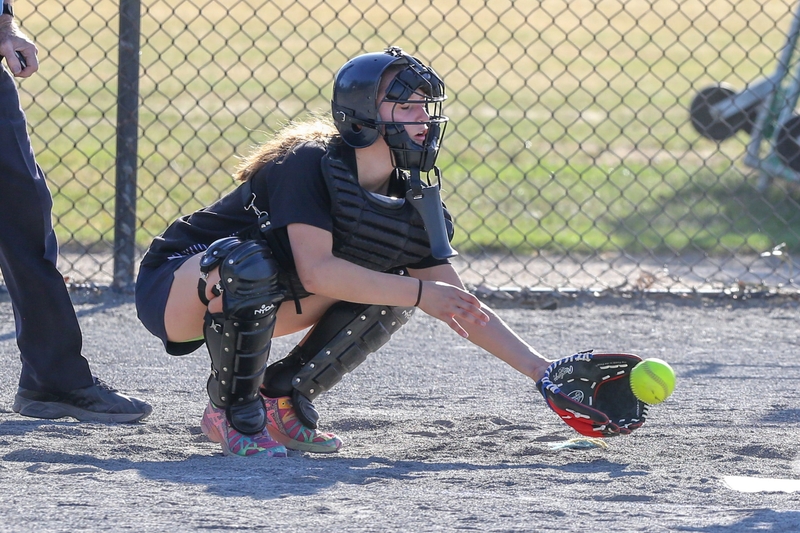 A special thanks also to Mrs Debbie Dunwoody, (who in her own playing days was an A Grade Softball Catcher), for being the assistant coach of the Junior team this week and for filling the role with expertise and enthusiasm. Thank you to Ms Liza Stevens, Miss Sophie Brugliera and Mrs Nareen Robinson for all their help with coaching the teams this term. In the last Camnews we shared news of Holly Williams being recognised in the 2019 Simpson Prize Competition. 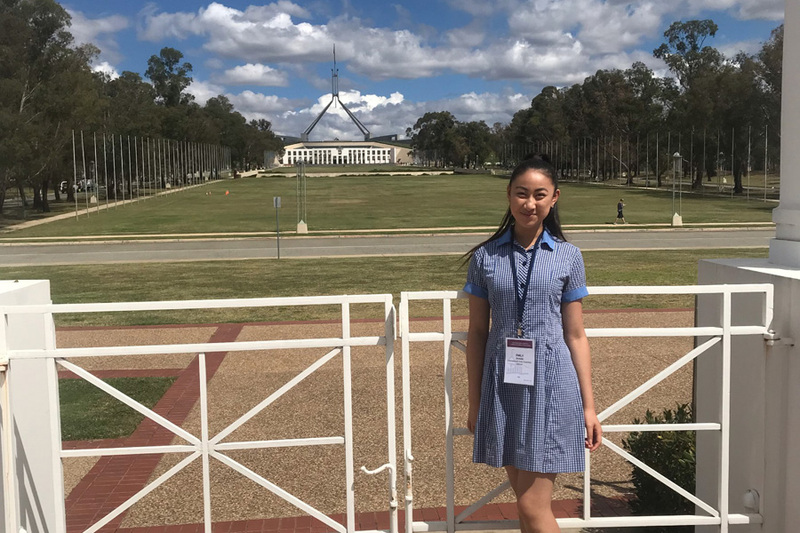 In assembly this week we were pleased to announce that Rachel Wong, Year 9, has been recognised for her essay entered into the competition. Rachel received a Highly Commended Award for her writing and we are extremely proud of this acknowledgement. The essay topic for the Simpson Prize this year was “To what extent could 1918 be considered a year of victory for Australia and its people?”. 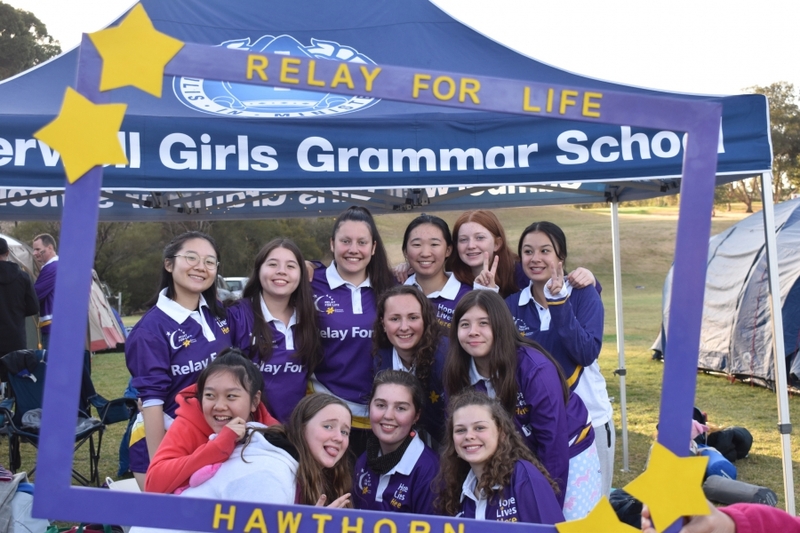 Over the weekend of 23 – 24 March, 25 CGGS students were part of the Cancer Council’s annual Hawthorn Relay for Life. The challenge was to have at least one member of the team walking the track at all times from 3.00pm on Saturday to 10.00am Sunday, in turn raising money through sponsorships. This involved a lot of walking, little to no sleeping while camping out, together with a positive attitude, a lot of food, a lot of blankets. There was an overpowering sense of community spirit and drive to make a difference in the lives of those past, present and future who have been or may be affected by Cancer. Half way through the relay there was a paper bag ceremony where we had a moment of silence for all those who have been, are or may be touched by cancer. Teams placed paper bags lit up with lights along the walking track. Written on each bag and differentiated by the colour of the bag, were the names and messages for those who have passed on or who are currently fighting cancer. The impact of seeing how many paper bags had been placed along the track gave just a tiny insight into the amazing difference cancer support services can make in the lives of someone battling this disease. Needless to say, this ceremony brought many of us to tears and showed us the tangible difference between simply donating to a cause blindly and actually taking action and being part of a larger symbol all across Australia for those who have been touched by Cancer. It sends a message that they are not alone, and they are part of a broader network of community members who will be there to support them when they cannot support themselves. As CGGS we felt proud to be part of this event, doing what we can to make a difference in the lives of these individuals and families. A huge shout out to our two Year 7’s, Imogen and Ella, who joined our team not knowing each other or anyone else in the group but who really wanted to join in and do their part to make a difference. They were able to leave this event with the knowledge that they had made an impact. They also gained a whole load of older sisters at the school who will be there to steer them in the right direction. A special mention to Imogen who wore her white and pink Unicorn Onesie the entire time no matter how hot she was and acted as a proud team mascot. Another important shout out to Mrs Dunwoody and Mrs Paula Kolivas who arguably had the worst shift of supervising us from 12.00am to 3.00am. Thank you to Mrs Dunwoody for being more awake than any of us during that time and to Paula for bringing us brownies when we needed them most. Walking away from this experience I was reminded of the importance of being involved and putting your hand up for things because you never know where it could lead you. As one of the Service Learning Captains this year I aspire to encourage other girls in younger year levels to share in a passion for Service Learning. I know that even after I leave school this year, I will be leaving behind a school filled with young girls who are passionate to see change and aren’t afraid to put themselves out there and take action to achieve it. 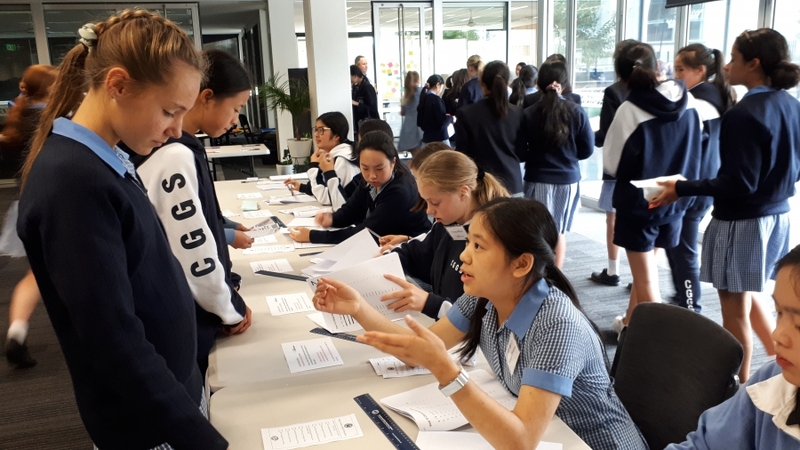 For the first time in 2019, students in Year 9 have the opportunity to undertake a core study in the area of Commerce. As part of our Term 1 focus, students have undertaken a dynamic unit of work relating to Power & Democracy. The culmination of this unit was the planning of an election campaign and a simulation of the electoral process. 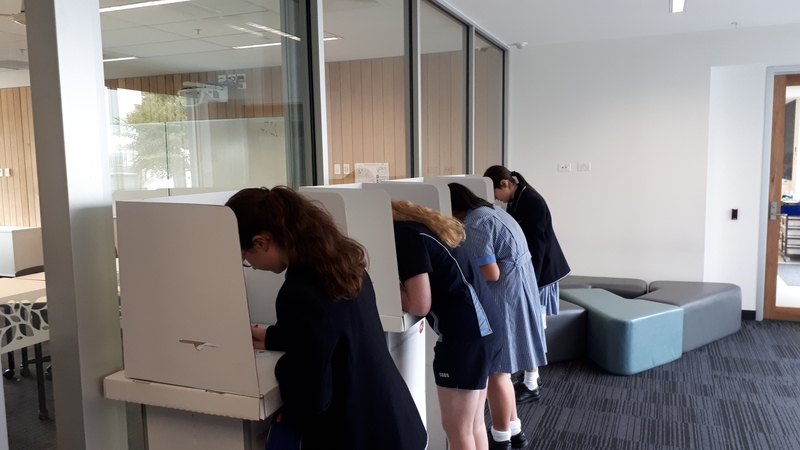 On Monday 1 April Year 9 students took part in a school wide general election. The event was a showcase of their campaigning across a range of current political issues and ability to influence voters via a democratic process. > Naming their party including the development of core values and branding that would allow them to stand out during the campaign. > Policy development, which including preparing a position on issues such as the date of Australia Day, off-shore processing of asylum seekers and potential changes to Australia’s freedom of speech legislation. > The creation of relevant advertising material including “How to vote” cards, a thirty second commercial, a webpage and an impassioned speech delivered by the leaders of each party. 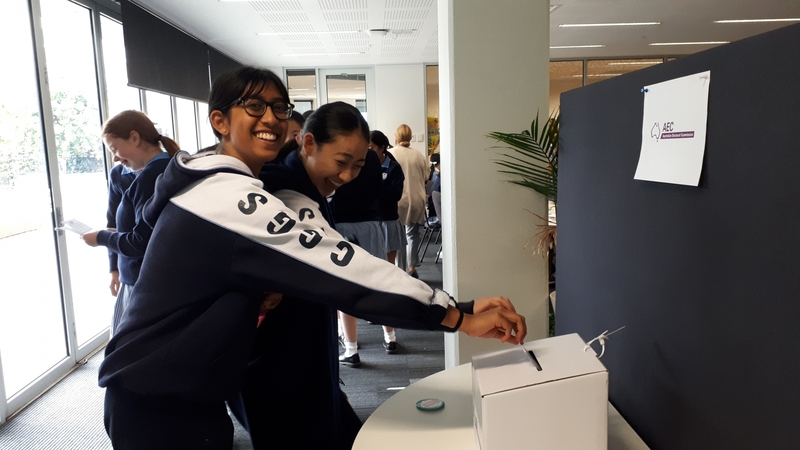 Once preparations were completed, it was time for the CGGS community to cast their votes. Nervous parties continued to lobby until the final votes were cast whilst key members performed various official roles. These included electoral officers, vote counters and scrutineers. Election day proved an overwhelming success with close to 300 voters having their say. As polling booths closed and votes were tallied, an incredibly close count highlighted the importance of preferences with the race narrowed to two parties. Eventually the Global Party claimed victory by a narrow margin over its rivals. 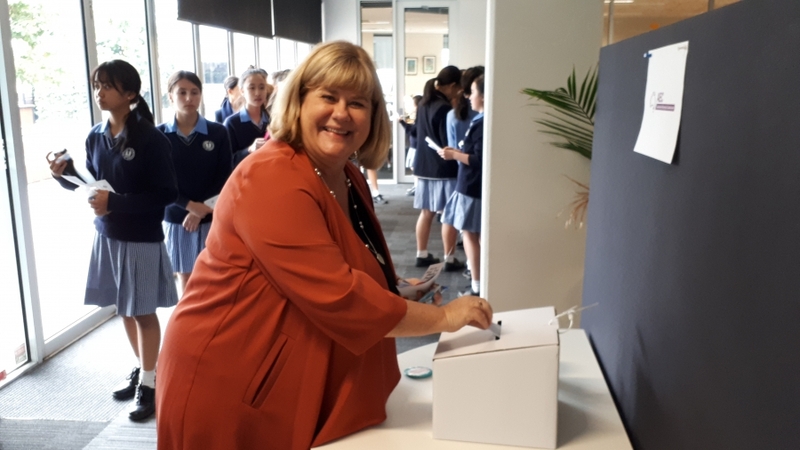 All students of Year 9 and, more importantly, all members of each party, are to be commended for their planning, preparation and professionalism both during the campaign and on election day. This entire unit of work highlighted the valuable nature of immersive learning and students of all political persuasions are to be congratulated on their efforts. During our previous assembly on 25 March, we launched the pilot episode of ‘The NES Show’! 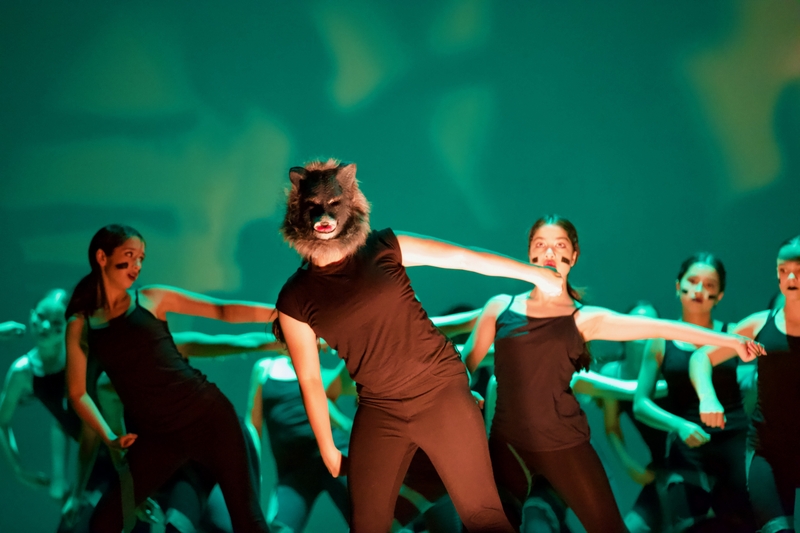 The show’s name was inspired by the catchy acronym of our names (School Captains – Nikki, Ellie & Stephanie), cleverly thought of by Mrs Poyser. One of our main goals for this year is to strengthen our school community, hence we thought to feature members of CGGS on our talk show. Our special guests were Miss Tan (Maths teacher), Mr Loff (Maths teacher) and Mr Clark (Geography teacher), or as we have called them, TLC! We thought TLC would be perfect to feature on our show as they are all new teachers to the school this year. Throughout the show, we discovered some fun facts about them, and discussed how they perceive our theme of this term, ‘zeal’, in the school community. TLC shared their admirable observations about our girls’ positivity and enthusiasm towards participating in recent events such as House Dance and House Athletics. Thank you to TLC for being fantastic guests on our show. We are so excited to continue ‘The NES Show,’ and to get to know more members of the CGGS community in our future episodes. 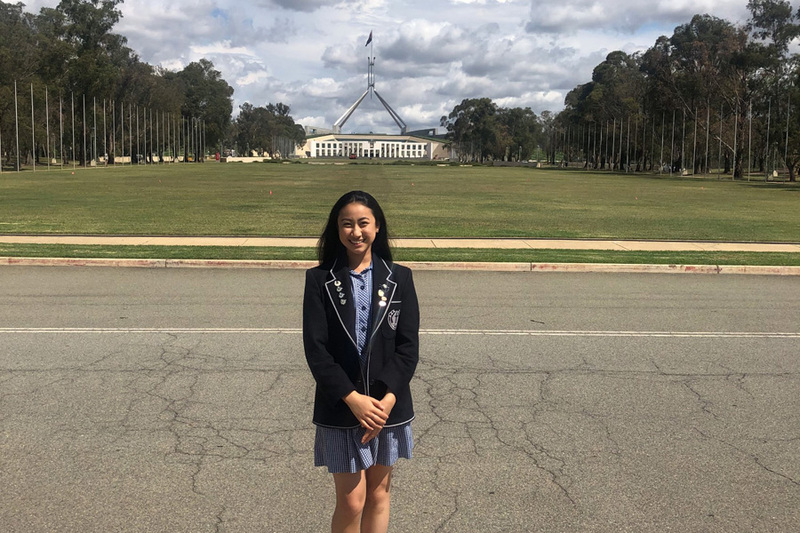 From Tuesday 19 March to Thursday 21 March, I was honoured to be among 24 other Victorian delegates, who travelled to Canberra to attend the 24th National Schools Constitutional Convention (NSCC). 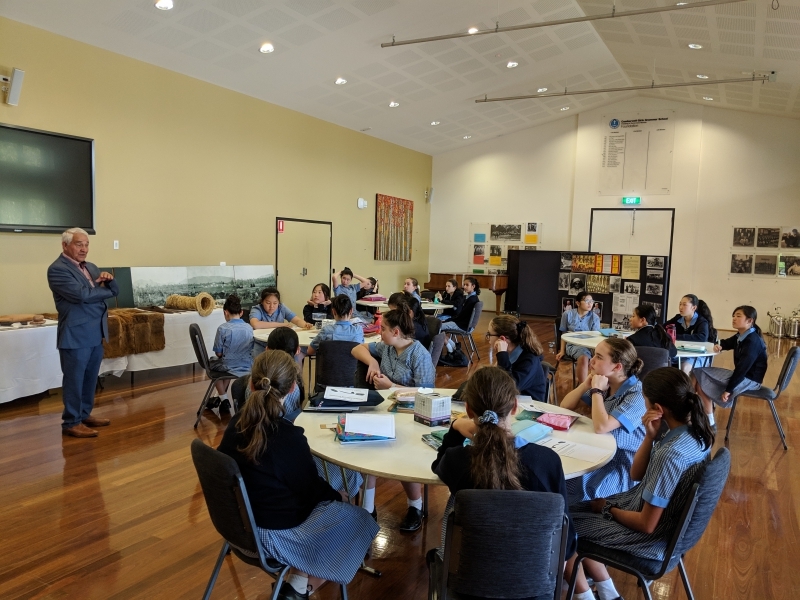 A total of 120 students from all parts of Australia were involved in the Convention held at the Museum of Australian Democracy, Old Parliament House. 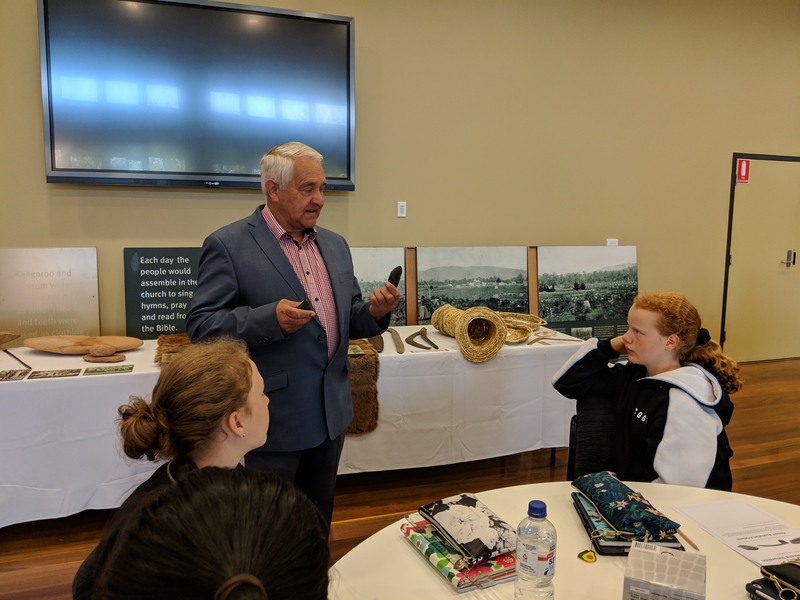 The topic for this year was – ‘A new constitutional preamble for Australia?’ Along with delegates from other states and territories, I came to Canberra not knowing much about the Constitution, let alone what a preamble was. We were incredibly fortunate to hear from federal government members Tony Smith MP (Speaker House of Representatives), Dr Andrew Leigh MP (Federal Member for Fenner) and Senator Sue Lines (Deputy President of the Senate), as well as university Professors and High Commissioners of other countries. Through our engagement in Panel Sessions and meetings, we had the chance to extensively discuss our views on the current preamble and how the Constitution could be better improved. After analysing and considering appropriate alterations, we were divided into 10 working groups to compose our own preamble. By the end of the Convention, a winning preamble was voted and a referendum was held to finalise whether or not our new preamble should be implemented to precede the Constitution. This was concluded with a national and state majority of “yes” votes from the students. Our time at Canberra truly opened doors for all 120 national delegates. 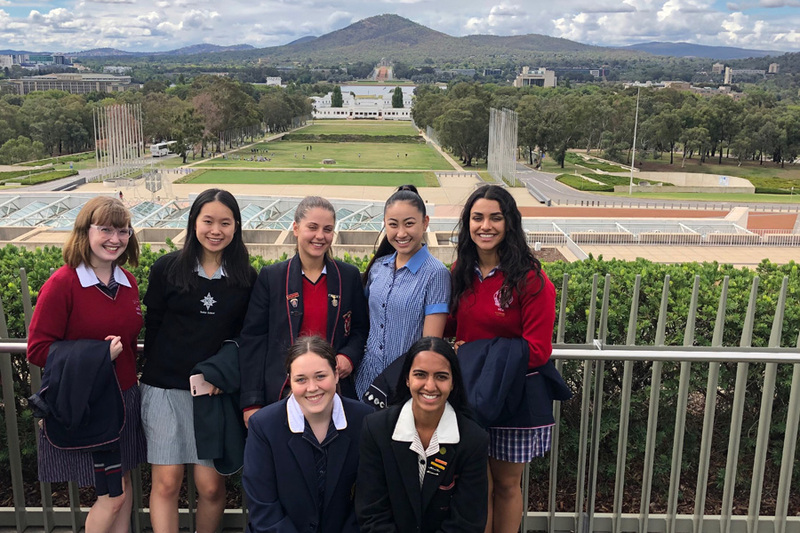 Along with amazing ambience at the Parliament House and an official dinner at The High Court of Australia, the opportunities we had to listen to speakers and voice our own opinions made the experience an incredible highlight. 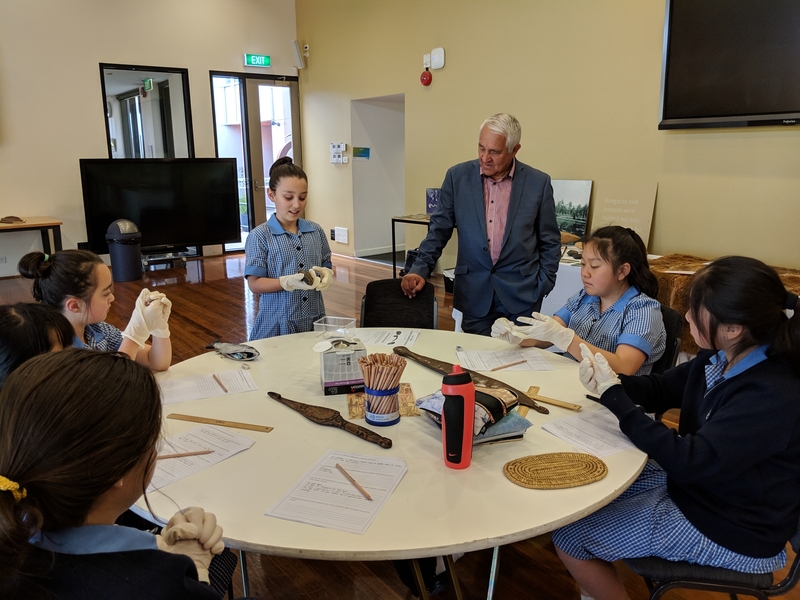 This week the Year 7 students were engaged in an Ancient Australia incursion with Murrundindi, tribal leader of the Wurundjeri people. 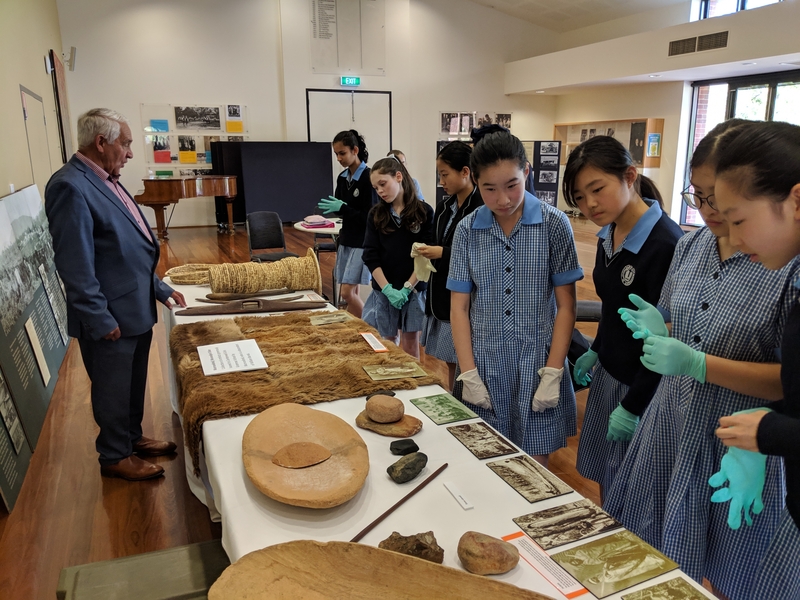 They were privileged to have access to many Indigenous Australian artefacts, including some belonging to William Barak. 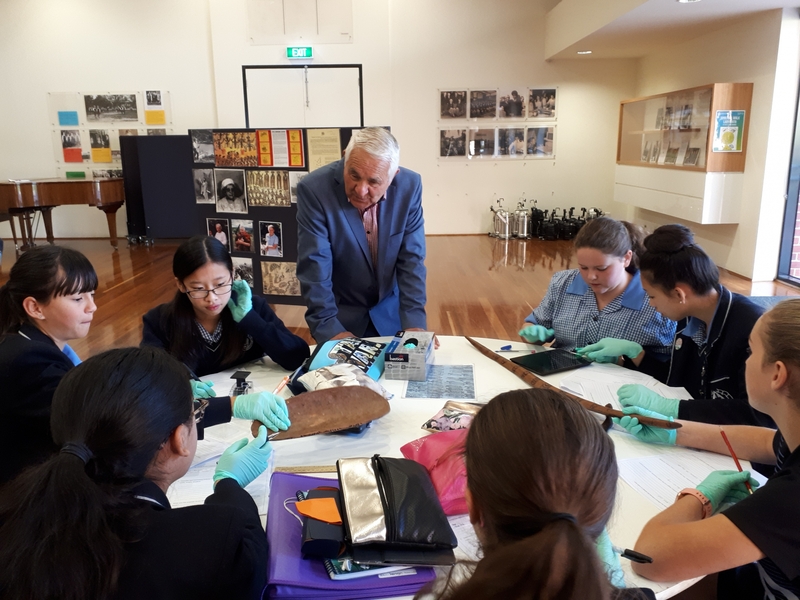 Students were given the opportunity to engage in the work of historians, investigating artefacts to make sense of the past. This gave students a more complete understanding of the culture of the original inhabitants of this land, and will be a strong basis for their next unit of study. The CGGS Saturday Netball season has begun for 2019 and already all teams have embraced all weather types. The Year 7 teams welcomed new members, with Year 7 Pearl playing a wonderful first game, defeating MLC Waratahs by 2 goals. Year 7 Quartz had a tough first game against Genazzano Brazil, the girls have trained well since and will put in 100% for their next game. Year 8 Silver played well in round 1, only going down to Flames by 4 goals. Year 8 Sapphires played a great defensive game against Ruyton Renegades, Sapphires put out a great fight but Ruyton were too strong in the end. Year 8 Jade got off to a great start against Fintona Ferns, the CGGS team jelled nicely together and defeated Ruyton 16-8. 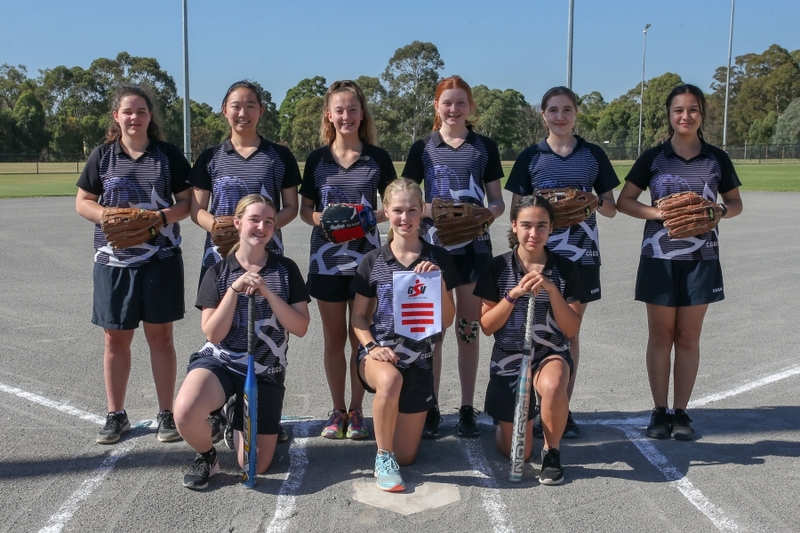 Year 9 Gold were defeated by Genazzano Watts 12-7 in round 1, but the girls played a fantastic team game last Saturday and defeated Strathcona Sunset by 6 goals, all girls have improved tremendously. Year 9 Diamonds started the season on a high, all playing well together and took the victory over Fintona Femmes by 3 goals. Year 9 Aquamarines were up had tough opposition in round 1 and will be looking to beat MGGS Tornados later in the season. Year 9 Amber had to seek for fill ins in round 1 and went down to Genazzano Gooden 26-5. Year 10 Turquoise had a very close game against Genazzano Molik, only going down to them by 1 goal, the CGGS team will be looking for the win next time they play. Year 10 Gems came up against tough opposition in round 1, MA Moonlight were unstoppable in their attack end. Year 11 Tanzanites have got off to slow start to the season, the CGGS team are looking forward to playing their best netball in round 3. Year 11 Emeralds got off to a fantastic start last Saturday, they were up by 1 goal at half time, but Ruyton Rubies were unstoppable in the second half and defeated Emeralds. Year 12 Crystals had a close game against MA Lightning, CGGS were down at the 3rd quarter break, but the team played well in the last quarter and defeated MA Lightning by 1 goal. The Year 12 Moonstones got off to a slow start for their first game back and ended up going down to Genazzano Pitman in round 1. Congratulations goes to all CGGS Saturday Netball Teams. 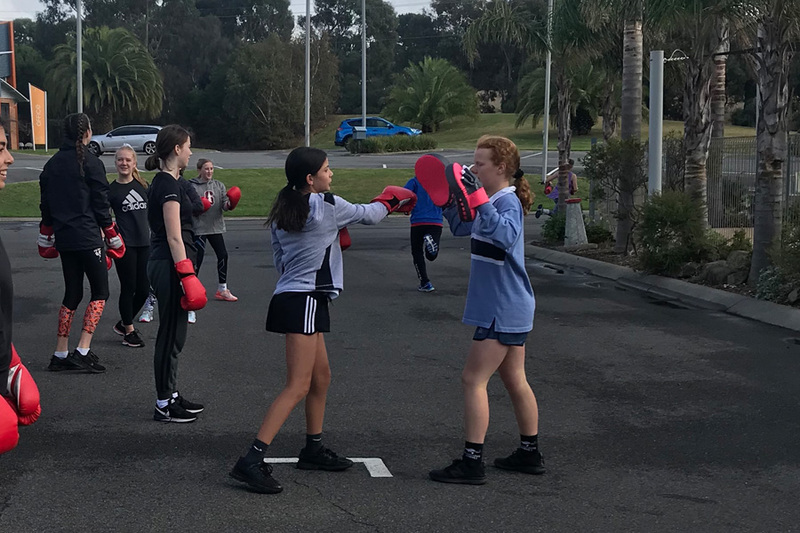 Last weekend, the CGGS fitness camp travelled to Phillip Island for an action packed weekend. 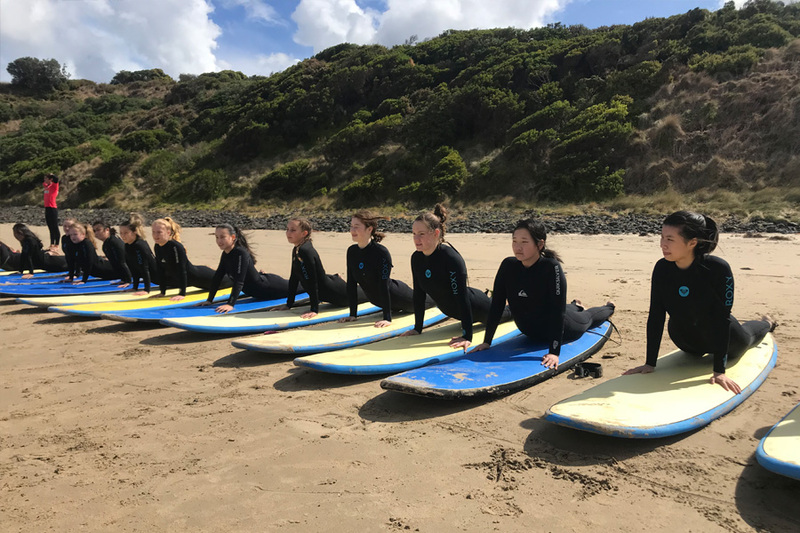 Despite the cold weather, the girls were eager to participate in surfing, yoga, boot camp, fitness games and beach activities. These experiences enabled students to develop teamwork, leadership and communication skills and work with girls from other year levels. The traditional Saturday night festivities saw students and staff dressed up in many creative costumes with the theme, ‘Around the World’. Our Sports Captain, Lucy Bartram, did a fantastic job organising the night’s activities where students had to create mascots and team tshirts, as well as answering some challenging quiz questions and competing in a variety of team challenges. The competitiveness of the night activities were a highlight and certainly displayed the friendships that have formed between different year levels. Thank you to the staff for their help throughout the weekend to ensure it was a successful and enjoyable camp. 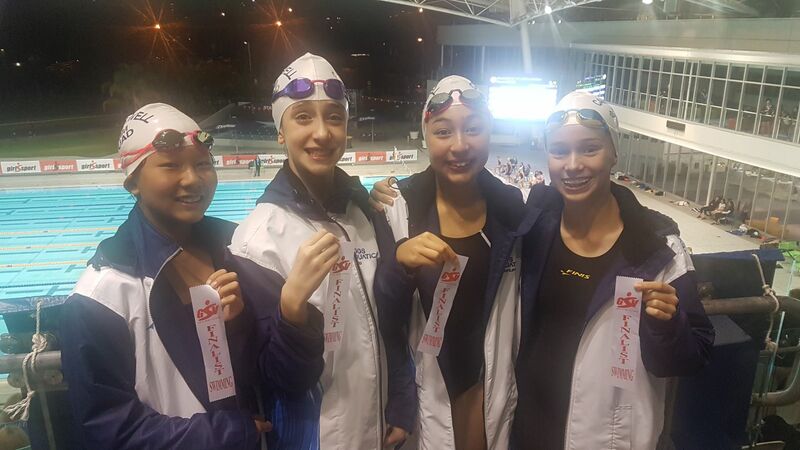 Well done to Anabel Car, Ella Robertson-Brown, Scarlett Giang, Xara Anderson, Monique Thorp, Emily Price, Sofia Sanfilipo, Sophie Chang and Izzie Wood who qualified for the Girls Sport Victoria Swimming Finals Evening last Tuesday. With a large crowd of parents and students cheering from the sidelines, the girls show cased their skills at Melbourne Sports and Aquatic Centre. They were very competitive against the top swimmers from 24 GSV schools, recording some personal best results. The girls are to be commended on their hard work throughout the season and we look forward to their future success. Tuesday evening saw the top 10 divers compete in each level (Senior, Intermediate, Junior) at the GSV Finals Evening for Diving at MSAC. Ella Robinson (Year 9) competed in the Intermediate division for CGGS after qualifying through her exceptional performance at the Championship Carnival with a score of 95.35. At finals evening, girls have to perform 4 dives from at least 3 different categories, either from the 1m or 3m boards. Ella completed all dives from the 3m and is to be congratulated on a very successful diving season where she has shown both leadership and commitment to both her own development and to the overall team.